Economic Resources: Whither Spain – Towards Finland or Argentina? Whither Spain – Towards Finland or Argentina? Well, here I am spending my last day in Sitges, attending the annual meeting of the Circulo de Economía (which is why I have been so silent). The annual meet up tends to attract many leading participants in Spanish economic and financial life. I have been here since Thursday, and gave a presentation on the need for som...e sort of internal devaluation. As Alfredo Pastor (who introduced me) said, what Edward was arguing six months ago seemed to be "catastrophist", now it has become the consensus. Interestingly, Dani Roderik, who spoke yesterday, came to very similar conclusions: Spain's needs a 20 % internal devaluation (or in his opinion should leave the Eurozone - I don't agree with this part). Keeping ahead of the curve, I am now starting to argue - as previewed in my latest AFOE post - that either we move soon on this, or Germany will inevitably have to go back (temporarily) to the Mark. The system won't hold otherwise. Given that opinions have changed so radically here in Spain in just six months, nothing can be ruled out at this point. Not even Zapatero stepping down. It is interesting to note that CiU gave him till the end of the year - he will not be able to pass a budget for 2011 - to do this, or there will be elections. So let's see if the leaders of PSOE are able to "factor in" what will inevitably happen, and take a decision now. Spain does not need elections. Spain needs a change at the top, a consensus government supported by all the main parties, and a swift internal devaluation. Interestingly a lot of people have spoken to me here over the last few days, and all the comments have been positive. Many of the people here seem to read me in La Vaguardia (Dinero supplement) on Sundays. I never realised I was so popular, in fact I had quite the opposite impression. Below you will find the English version of my press release. I entitled my presentation "Spain - Finland or Argentina". I think the reason for this should be fairly clear. Back in the early 1990s, following an uncontrolled credit boom, Finland underwent a deep depression as its GDP dropped by around 14% and unemployment rose dramatically from 3 to almost 20%. Initially the Finish government refused to recognise the severity of the situation, and the economy failed to recover. Then they took the “bull by the horns”, carried out a series of deep structural reforms and as a result the country is now widely recognised as a model of flexibility and good practice. The other path is to do very little, live in hope, and expect the worst. This is the road to ruin and decay. The Argentine path. The Finnish case was of course a little different from the situation Spain now faces, since Finland had its own currency, and was thus able to restore competitiveness through a substantial devaluation, a devaluation which then required the creation of a bad bank to relieve lenders of toxic assets produced by the rapid rise in non perforing foreign currency loans. To many in Spain this kind of radical price and wage adjustment proposal is simply unrealistic. But at this point there are few remaining alternatives. Spain is gradually replacing Greece as the focus of global investor concern, and while people in Spain may have little appetite for such drastic changes, they should never forget that across in Germany, where people are now being asked to authorise funding for substantial loans to be used on Europe’s periphery, support for proposals that the country return to the Deutsche Mark is growing by the day. As the IMF point out, any comprehensive strategy to move the Spansih train along the track which leads to the Finland station requires broad political and social support, while time is of the essence. Spain - Finland or Argentina? “Spain’s economy needs far-reaching and comprehensive reforms. The challenges are severe: a dysfunctional labor market, the deflating property bubble, a large fiscal deficit, heavy private sector and external indebtedness, anemic productivity growth, weak competitiveness, and a banking sector with pockets of weakness. Ambitious fiscal consolidation is underway, recently reinforced and front-loaded. This needs to be complemented with growth-enhancing structural reforms, building on the progress made on product markets and the housing sector, especially overhauling the labor market. A bold pension reform, along the lines proposed by the government, should be quickly adopted. Consolidation and reform of the banking system needs to be accelerated. Such a comprehensive strategy would be helped by broad political and social support, and time is of the essence”. 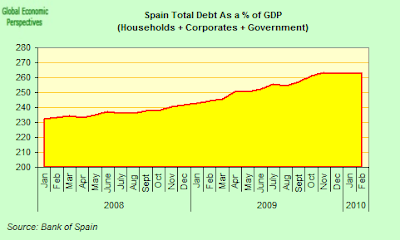 Following a decade long housing “boom” Spain now has an enormous debt problem. 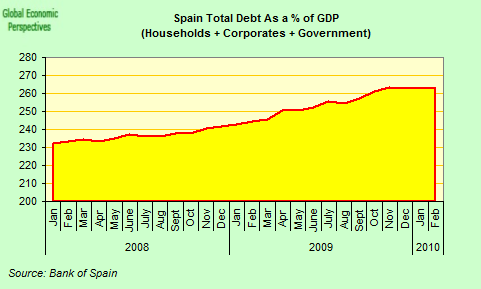 The combined debt level of Spain’s households, companies and government now amounts to some 265% of GDP. However, in contrast to the situation in countries like Greece and Italy, Spain’s endebtedness problem is not principally one of massive public sector debt. The main component of Spanish debt is private – between households and companies accumulated debt amounts to some 210% of GDP. Spain is not, by a long stretch, the only country to suffer from such a high level of private indebtedness. There is, for instance, the example of the United States, where total indebtedness now significantly exceeds the 300% of GDP level, a threshold which many consider to be highly structurally significant. The sheer fact of knowing you share this problem with other larger, and richer, countries may be soothing, but it should also give an indication of the kinds of difficulty Spain may experience in interacting with the external environment, since solutions will need to be found which fit the needs not of one isolated country, but of various countries, all at one and the same time. After an extremely severe recession the Spanish economy has now been stabilised. Industrial output has stopped falling, and retail sales have even started to rise slightly. Output in the bloated construction sector, as was to be expected, continues to fall, as do house prices. Unemployment has stopped rising, although employment, and participation in the Social Security system continues to fall. At the same time the previously large migration flows have now all but dried up. But this stabilisation comes at a price, given that is the result of a dramatic surge in current government spending and a huge liquidity support operation for the financial system being supplied by the ECB. As is by now well known, this increase in public spending has produced a further problem – one of a large government fiscal deficit – and this development has served to attract the attention of the international investors on whom Spain depends for its financing at precisely the time that the issue of sovereign debt in the ageing societies of the economically developed world is starting to become a cause for concern in the financial markets. The principal difficulty facing the Spanish economy at the present time is that while the emergency measures have served to buy time, this time has not been wisely employed, and the measures have simply served to exaccerbate the underlying structural problems rather than resolve them. According to the National Statistics Office (INE), the slight economic expansion that was achieved in the first quarter of 2010 (0.1% growth) was the combined result of an increase in internal demand and a worsening of the net impact of external demand – precisely the opposite of what you would want to achieve. In other words, while Spain’s exports did increase, the growth in domestic demand in conditions of limited international competitiveness meant that imports increased even more. 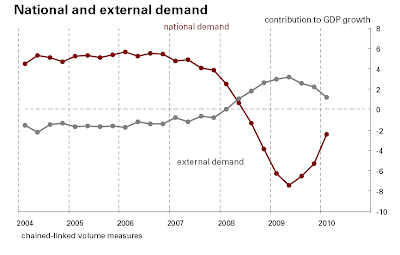 On an interannual basis the negative impact of national demand reduced (from -5.3 percentage points to -2.5 percentage points – see chart below) while the positive impact of external demand fell (from 2.2 percentage points to 1.2 percentage points). To be clear, growth in the first quarter of 2010 was due to rising domestic demand, and not rising exports, which means the real impact of the increase in government spending and the liquidity measures applied by the ECB since June 2009 has been to reverse the positive trend in the goods trade deficit which had been seen in earlier quarters. As the Spanish government stresses, the country’s share in world exports has remained more or less constant since the start of the century, but at the same time Spain’s share of world imports has increased. 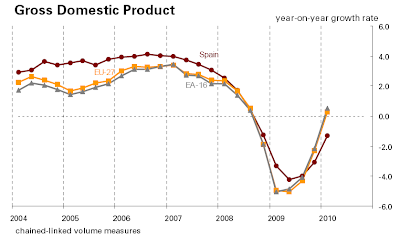 Put another way, thanks to the foreign funds which flowed in to finance the housing boom Spain became a major imports powerhouse, with the consequence that both the trade and the current account deficits deteriorated sharply, while a significant part of Spanish industry simple died. One of the major tasks of any recovery programme is to bring this industry back to life. In this sense what Spain’s economy needs is not rejuvenation but resurrection. 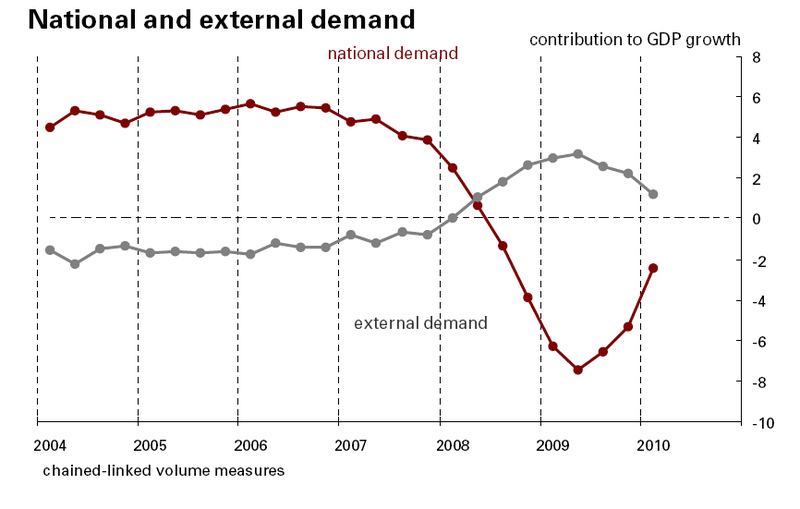 With a highly integrated global economy as the background, Spain’s seemingly insatiable demand to build and buy ever more housing units was satisfied via the massive entry of migrant labour (5 million immigrants in 10 years), and substantial ongoing capital inflows (a current account deficit of around 10% of GDP), which both served to raise the short term capacity of the economy, but lead to the consequence that Spain today is a highly over-indebted country – net external debt is around 90% of GDP – while a large part of the manufacturing base which would have facilitated paying down the debt now no longer exists. As a result – and as Mr Zapatero repeatedly stresses – it is the case that the accumulated debt of the Spanish government is not (yet) inordinately large when compared to that of its peers, although as a share of GDP it has been increasing rapidly in recent quarters. To reduce this debt burden the Spanish economy needs two things: inflation and growth, although it should be stressed that competitiveness can only be restored by some form of price and wage deflation. In a modern, mature, economy growth in aggregate demand only comes either via an increase in the level of credit, or through an increase in exports. 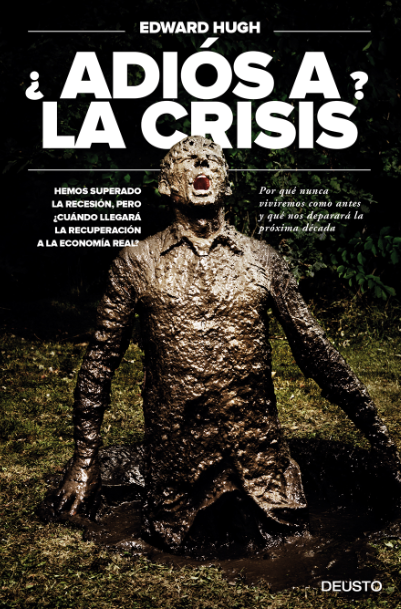 The problem that Spain faces is that, on the one hand all sectors of the economy (households, companies and government) are now heavily over-endebted and deleveraging as fast as they can, with the result that – on aggregate – they are demanding less (not more) credit. 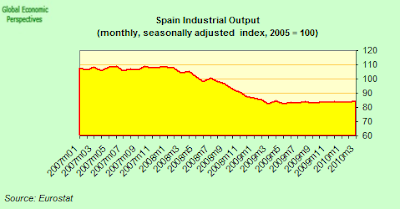 On the other hand, the Spanish economy is not sufficiently competitive to be able to grow simply by relying on exports. In addition, systematic dependency on external financing is never a good thing, since your creditors can always impose conditions on you which may not be to your liking. 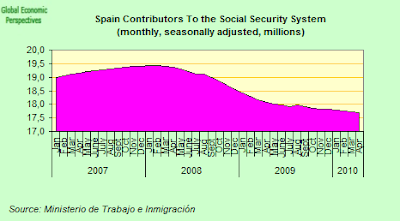 Despite the fact that the commitment to reduce Spain’s fiscal deficit by 5% of GDP in 2 years is, in and of itself, a very strong one, the country actually has to make a far greater fiscal effort than it seems, due to the commitment contained in the recent Ley de Economía Sostenible to reduce substantially the quantity of unpaid receiveables on the public sector account books. Spain’s Autonomous Communities alone have some 30 billion (or around 3% of GDP ) in payments oustanding as of the last quarter of 2010 – which means there will need to be a reduction in spending of something like a additional 1% of GDP a year over the adjustment period under this heading alone. The need to restore order to Spain’s public finances will mean that the adjustment will be even more painful than generally envisaged, and that the impact of the correction on the economy generally will be more severe. Thus, it is rather unlikely that the Spanish economy will grow in 2011 as many expect. Weighed down by a heavy fiscal correction, an unacceptably high level of unemployment, private demand in slight contraction and a weak growth rate in exports, it is probable that the economy will once more contract, possibly by between 1% and 2%. To conclude, Spain stands at a crossroads, and important decisions need to be taken. A fiscal adjustment is necessary, but the country also needs a competitiveness adjustment in the form of a substantial reduction in the wage and price level (possibly by 20%). If this is not implemented the dynamic of Spain’s debt will surely become unsustainable. Spain has two – and only – choices at this point. It can follow Finland’s example in the 1990s, take the bull by the horns and use the present crisis as an opportunity to transform the Spanish economy into a new economic miracle, or it can remain in denial about the severity of the problem, let things drift until they can do so no longer, and then follow Argentina down the road of ruin and despair. To cite the words of the latest IMF report: “Such a comprehensive strategy would be helped by broad political and social support, and time is of the essence.” Ladies and gentlemen, enough is enough. Nearly three years have now been wasted, and it is time to act.